Who can have Christmas without mince pies right?! Not me!! But I wanted healthier versions, mainly so I could eat more of them! So this recipe is for 6 mince pies, they are chunky and filled to the brim with fruit! I have to admit the first time I made these I doubled the mixture and accidentally put them in the oven too high and they came out more like rocks! Everyone has their bad days!! When I eat mine I warm them up in the microwave for about 40 seconds and top it with Alpro Soya cream. Delicious on a winters evening. Pre-heat the oven to about 150 degrees. Place all of the dried fruit and the juice from the oranges in a saucepan. Heat for about 15-20 minutes, or until soft. In a food processor, add in the ground almonds, buckwheat flour, dates, vanilla extract and coconut oil. Blend until smooth, adding water as you go along. You should be able to form a ball of dough. 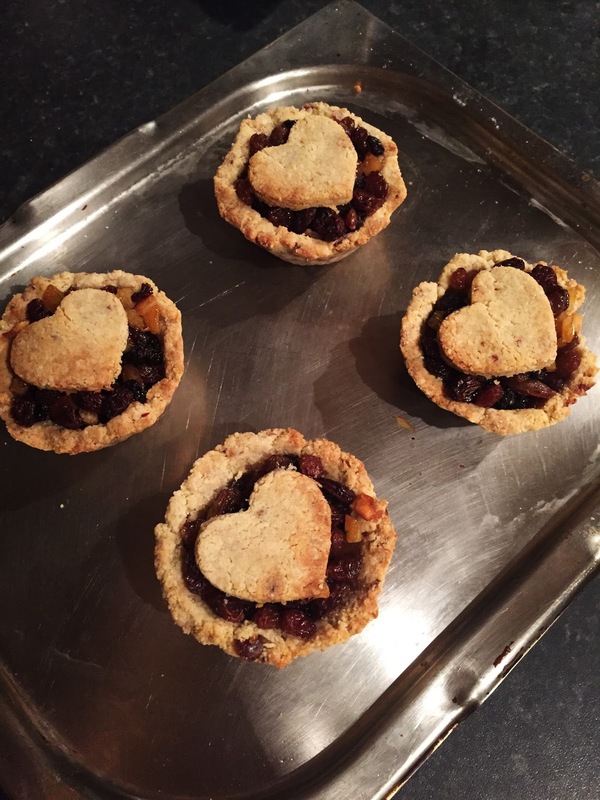 I split the mixture into 7 pieces and used 6 silicone cases to create the base of the mince pie. Once moulded, spoon in the cooked filling and use the remainder to create a shape to place on top. Place in the oven and cook for 20-25 minutes.